quality. Dosage: 6 grams per litre. 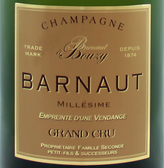 The ripening of the grapes took place this year under real summer conditions that Champagne had not known since the summer of 2003. Hot, dry and very sunny weather accompanies the veraison during the second half of August. The rainy interlude at the beginning of September will mainly result in a magnification of the grapes before the first shots of secateurs. The return of a summer time from September 5 allowed the grapes to complete its maturation in optimal conditions. We will remember the 2009 harvest as a vintage with an irreproachable health quality with almost no trace of botrytis. Bouzy is a village of Grande Montagne de Reims, especially of the "Côte des Noirs (Coast of Blacks)" because stronghold of Pinot Noir. On its slopes, vine grows on soils constituted of fragments of millstones, pebbles and sand mixed with clays of decalcification of millstones, resulting of runoff. Silts of the plate cover with a fertile coat the tops of hills, and old alluvium formed of sand, gravel and chalk pebbles. The basement is chalk bélemnites upper Santonian (Campanian) and chalk micrasters Lower Senonian of the Marne. Deposed by the seas of the end of the Mesozoic era, there was a few hundred million years the chalk of Cretaceous can go down to 200 meters deep. It absorbs heat and returns it. She did the same with water to regulate the absorption by vines that plunges its roots up to 3-4 meters deep. The climate is generally that of the Paris Basin, with generally mild winters, uncertain spring, hot summers and cool autumns but usually quite beautiful. Vines grown on the principle of sustainable viticulture, using organic fertilizers, natural weed and other techniques to preserve the best of nature. The old vines are no longer torn but maintained by inter-planting to preserve the diversity of genetic potential. Alcohol level (% vol. ): 12.5% % vol. taste worthy of the greatest crus. Fish with cream, fish terrines, raw fish - Shellfishes, grilled shellfish, seafood, shellfish in sauce, shrimps and prawns, cassolette of shellfish, fresh shellfish.